The Stanford Cardinal football program represents Stanford University in college football at the NCAA Division I FBS level and is a member of the Pac-12 Conference's North Division. Stanford, the top-ranked academic institution with a FBS program, has a highly successful football tradition. The team is currently known as the Cardinal, adopted prior to the 1982 season. Stanford was known as the "Indians" from 1930 to January 1972, and the "Cardinals" from 1972 through 1981. A student vote in December 1975 to change the nickname to "Robber Barons" was not approved by administrators. The program has an all-time record of 628–448–49 for a winning percentage of .580 and has winning series records against all of its Pac-12 North rivals, except for the Washington Huskies, against whom they are 41–42–4. Stanford claimed National Championships in 1926 and 1940. In 1926, led by legendary coach Glenn "Pop" Warner, who still has the most wins in Cardinal history, the team was undefeated in the regular season and tied Alabama in the 1927 Rose Bowl. The 1940 team went unbeaten and untied after defeating Nebraska 21–13 in the 1941 Rose Bowl, but the team ranked #2 in the final AP poll released before the game was played. Pop Warner's era predated the AP poll, but Stanford has finished at least one season in the Top 10 in six different decades under seven different coaches: Claude E. Thornhill in 1934, Clark Shaughnessy in 1940, Chuck Taylor in 1951, John Ralston in 1970 and 1971, Bill Walsh in 1992, Jim Harbaugh in 2010, and David Shaw in 2011, 2012, and 2015. Stanford's most recent season finish in the top 5 was in 2015 after the #5 Cardinal dismantled Big Ten West Division Champion #6 Iowa Hawkeyes 45–16 in the 2016 Rose Bowl to finish with a record of 12–2 (Stanford's third 12-win season ever, after 2010 and 2012) and a final ranking of #3 in the final AP Poll and the final Coaches Poll (Stanford's highest AP Poll ranking since 1940 and its highest Coaches Poll ranking ever). The Cardinal have played in 27 bowl games in their history, including 17 appearances in bowls now comprising the College Football Playoff, specifically 15 Rose Bowls (the third-most appearances of any team, behind only USC's 33 appearances and Michigan's 22), the 2011 Orange Bowl, and the 2012 Fiesta Bowl. Quarterback Jim Plunkett is the only Stanford player to win the Heisman Trophy, doing so in 1970. Four Stanford players have finished second in Heisman voting: quarterback John Elway was second to Herschel Walker in 1982; running back Toby Gerhart was second to Mark Ingram in 2009; quarterback Andrew Luck finished second to Cam Newton in 2010 and to Robert Griffin III in 2011; and Christian McCaffrey finished second to Derrick Henry in 2015. The early portion of Stanford's football history was largely successful, particularly in the 1920s under Warner and the 1930s under Claude E. Thornhill. During this time, the Indians appeared in six Rose Bowls and won a national championship. The team won a second championship in 1940 under the leadership of first year coach Clark Shaughnessy. Overall, from 1924 to 1941, Stanford totaled a 122-45-9 record and appeared in seven Rose Bowls. Stanford also enjoyed a fine parade of All-American running backs during this time, including Ernie Nevers, Bobby Grayson, and Hugh Gallarneau. Following 1941, Stanford football entered a period of regression. The team only reached two bowl games (a 1950 Pineapple Bowl win and a 1952 Rose Bowl loss) from 1941-1969. The team had 5 different head coaches over this span, and often finished near the bottom of the conference standings. It was during this time that Stanford moved from the Pacific Coast Conference to the Athletic Association of Western Universities (1959), then moved to the Pacific-8 Conference in 1968. Although the team struggled for the most part, there were a few individual bright spots, most notably quarterbacks John Brodie and Bobby Garrett. The program experienced a turnaround with the arrival of QB Jim Plunkett. Plunkett and a stout defense led the team to a 9-3 record in 1970, an effort which resulted in a Rose Bowl victory, the program's 4th. Plunkett also won the Heisman trophy that season, and he remains the only Stanford player to receive the award. Stanford won the Rose Bowl again the following year, 13-12 over Michigan, as Stanford kicker Rod Garcia booted a 31-yard field goal with 12 seconds left in the game. Stanford would experience more limited success late in the 1970s, during Bill Walsh's short tenure as head coach. In 1979, future NFL hall of famer John Elway enrolled at Stanford. Elway became one of Stanford's most iconic and successful players; however, the team struggled during his tenure. Elway's career culminated in a 1982 Big Game loss to rival California, a game Stanford athletic director Andy Geiger said cost Elway the Heisman Trophy. The Cardinal enjoyed moderate success in the final decade of the 20th century under Tyrone Willingham. The team finished 44-36-1 under Willingham's seven-year tenure (1995-2001), and appeared in the 2000 Rose Bowl, which they lost to Wisconsin. Troy Walters was arguably Stanford's best player during this time, receiving All-American honors and the Fred Biletnikoff Award in 1999, and setting school career records in receiving yards and receptions. After half a decade of heavy struggles, including a disastrous 1-11 campaign in 2006, the team returned to prominence in a big way with the hiring of head coach Jim Harbaugh. Harbaugh turned the program from bottom-feeders into BCS contenders in four years, and ended his coaching career at Stanford with a blowout win over Virginia Tech in the Orange Bowl. After Harbaugh left to coach the San Francisco 49ers, the team's offensive coordinator David Shaw became head coach. Shaw led the team to three consecutive BCS bowl games, including two Rose Bowls. 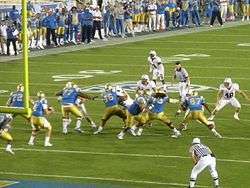 The team was led by its quarterback, Andrew Luck, and its dominating defense. After Luck departed for the NFL Draft, Kevin Hogan became the team's starting quarterback. Hogan led the team to a Rose Bowl victory over Wisconsin. The team returned to the Rose Bowl again the following year in the 2013 season, but lost a heart-breaker to Michigan State. After a rebuilding season in 2014, the 2015 season saw Shaw and Hogan lead Stanford to its third Pac-12 championship in four years, and consequently, its third Rose Bowl in four years. With the 2015 conference title, Shaw became the first Stanford coach in 80 years to win three conference titles and only the third ever in program history (after Tiny Thornhill from 1933–1935 and Pop Warner in 1924, 1926, and 1927). Stanford's main rival is Cal. The rivalry between the two schools is one of the oldest in college football. The two teams play in the Big Game with the winner receiving the Stanford Axe. Currently, Stanford leads the series 59-46-11 and has won the last 5 meetings. The most famous moment of the rivalry occurred in the 1982 Big Game, when Cal used a series of laterals to defeat Stanford 25-20 as time expired. Stanford maintains an active rivalry with USC. USC currently leads the series 60-29-3, but Stanford has made the series more competitive since the hiring of Jim Harbaugh. In 2007, an unranked Stanford team upset a # 1 ranked USC team 24-23. Stanford was a 41-point underdog prior to the game, and many observers have called it the greatest upset in college football history. In 2009, Stanford defeated USC 55-21, resulting in a post-game verbal confrontation between Harbaugh and USC head coach Pete Carroll. In 2013, USC returned the favor by defeating # 5 Stanford 20-17. In 2015, un-ranked Stanford went into L.A. and left with a 41-31 win over #6 USC, with Stanford QB Kevin Hogan playing the majority of the second half with a sprained ankle. Notre Dame and Stanford have been rivals since 1925. The two teams have met every year since 1988, with the exception of 1995 and 1996. Notre Dame leads the series 19-10. ↑ Games for 1891 season were played in early 1892. ↑ "Stanford Football". Stanford Department of Athletics. Retrieved October 24, 2013. ↑ "Stanford Identity Toolkit". Stanford University. 2015-07-07. Retrieved 2015-07-07. ↑ In virtually all rankings of U.S. universities, Stanford is rated in the top six with Harvard University, Yale University, Princeton University, MIT, and Caltech. None of these field an FBS team. ↑ "What is the history of Stanford's mascot and nickname?". Stanford University Athletics. Retrieved October 24, 2015. 1 2 "Stanford vote favors "Robber Barons" tag". Spokane Daily Chronicle. Washington. Associated Press. December 5, 1975. p. 17. ↑ "Prince Lightfoot objects to name". Victoria Advocate. Texas. Associated Press. December 6, 1975. p. 2B. ↑ According to the Stanford Football media guide, the all-time series records against the rest of the Pac-12 North are: California, 61–46–11; Oregon, 46–32–1; Oregon State 54–25–3; Washington State 40–25–1. ↑ Groke, Nick (December 12, 2015). "Derrick Henry wins Heisman Trophy, Christian McCaffrey finishes second". The Denver Post. Retrieved December 12, 2015. ↑ "Stanford to retire John Elway's No. 7 jersey". NFL.com. Retrieved 20 September 2015. ↑ "Hall of Famers". College Football Hall of Fame. Retrieved 2007-05-20. ↑ "Colleges: Pro Football Hall of Fame". Pro Football Hall of Fame. Archived from the original on 2007-05-12. Retrieved 2007-05-20. ↑ "The Stanford Athletic Hall of Fame". Stanford Department of Athletics. Retrieved 2007-05-20. ↑ "NFL Colleges: S". ESPN.com. Retrieved January 19, 2014. 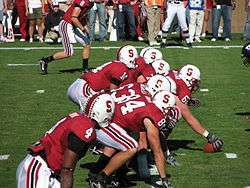 ↑ "Stanford Cardinal Football Schedules and Future Schedules". fbschedules.com. Retrieved 2015-11-28.